Photographs by Emily D Photography. Jennifer and Dave had been together for twenty years, and married for ten. During that time, they had faced some challenges, and their lives transformed when they became parents to a son and daughter. 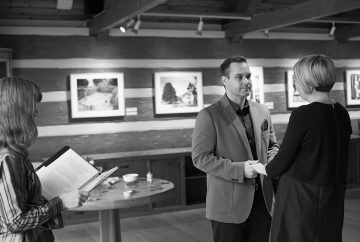 A vow renewal seemed the perfect way to reaffirm their commitment and appreciate how far they had come together, in a more intimate and informal atmosphere than their wedding day. Their renewal took place on a gorgeously sunny November morning in the Founders Lodge of the McMichael Canadian Art Collection in front of the picture window looking out on the fall trees. To begin, Jennifer, Dave and their children were each invited to place a beautiful fall leaf on the ceremony table, one they had selected on a family walk together. The leaves represented the uniqueness and love they each bring to their family. When I offered to act as an informal M.C. 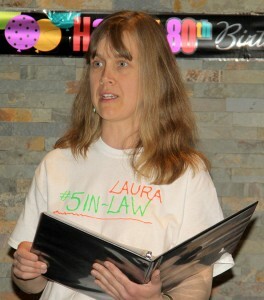 and Celebrant for my mother-in-law, Sheila’s, 80th birthday party, there were many possible options. In addition to speeches by family and friends, we could share some of her life events and stories, maybe have a trivia game based on little-known facts about her, or convey some of her life-taught wisdom. When I talked to Sheila about what she wanted, and more importantly didn’t want to happen at her birthday party, I learned that aside from speeches, these ideas did not appeal to her. I wondered, what else might allow a group of family and friends to share some memories and express their love for her, in a way that she would be comfortable with? What hadn’t I thought of?